When thinking about peppermint oil, what comes to mind? The first answers likely are chewing gum and toothpaste. Peppermint also can be a delicious addition to many foods such as ice cream, tea and even smoothies. What many people don't know, however, is that peppermint essential oil actually has powerful health benefits. The most popular use of peppermint oil is to relieve stomach upset. Peppermint oil tea has been used for hundreds of years to soothe indigestion or even things such as bloating and nausea. According to Dr. Joseph Mercola on his website, peppermint oil is a safe alternative to medications to reduce colonic spasms. The menthol found in peppermint oil is what’s responsible for this health benefit, and its strength is increased in the essential oil form of peppermint oil. The menthol helps to decrease the muscle spasms and may even help ease irritable bowel syndrome symptoms. If you've ever had a cold and tried to use Vick’s vapor rub to help reduce nasal congestion and unclog a stuffy nose, try using peppermint essential oil instead. It's much stronger and may help to reduce congestion and even reduce inflammation in the respiratory tract. Peppermint oil is an excellent natural remedy for colds,and upper respiratory infections. It makes sense that this essential oil can help to relieve pain from sore and tired muscles. If you think about all of the pain-relieving gels on the market, most of them contain menthol. Why use a store-bought option when you can use the real thing? Peppermint essential oil improves a massage and can even be added to a bath to reduce overworked and tired muscles and joints. You can also try adding a couple of drops to your temples when experiencing a headache to reduce tension. Lavender essential oil isn’t the only option when looking for a natural way to reduce stress. Peppermint essential oil can actually improve energy while reducing stress and tension at the same time. This essential oil can also help to promote clarity and boost concentration. Try adding a couple of drops to the palm of your hand and taking a few deep breaths in for a mid-day pick-me-up that doesn’t involve caffeine. Did you know that peppermint oil is one of the best kept secrets for healthy hair? Try adding two or three drops of peppermint essential oil to your shampoo or conditioner to help to stimulate the scalp and reduce dandruff, notes Dr. Axe. 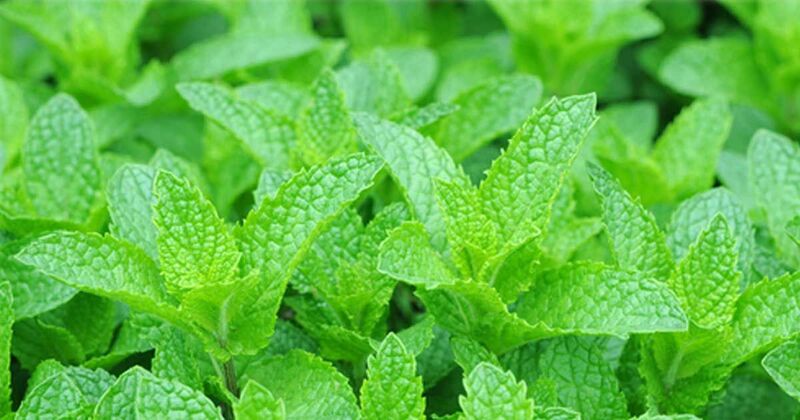 If you’re dealing with hot and humid summer conditions and the mosquitos are driving you crazy, Turn to peppermint essential oil, which acts as a wonderful natural bug repellent. A handful of other bugs are also deterred by the scent of peppermint oil such as ants, spiders and even cockroaches. Looking for a natural way to help bring down a fever? Peppermint essential oil is known for its cooling effects, so what better way to use it than to cool the body when fighting a fever? Try adding a couple of drops of peppermint essential oil to an organic lotion or some coconut oil and adding it to the bottom of your feet to help naturally bring down a fever. If you have dull and dry skin, add peppermint essential oil to your organic hand cream. Peppermint can nourish the skin while also improving the texture of oily skin. This is one of the reasons why this essential oil is helpful in preventing acne. Peppermint essential oil is also often found in chopsticks because of its ability to help to relieve dry lips. Peppermint essential oil can also help ease itchy skin. The cooling effect of this oil will help to put an end to the itch almost immediately. Peppermint essential oil also acts as an anti-inflammatory agent and can improve the symptoms of numerous skin conditions that can lead to itching including poison ivy and poison oak. Although most toothpastes are peppermint flavored, the majority of them are not actually made from peppermint essential oil. Pure peppermint essential oil carries antiseptic agents to help prevent bacterial growth in the mouth and can also prevent bad breath. Dr. Axe suggests adding one one to two drops to your toothpaste. For those who suffer with gastric emptying conditions, peppermint oil may be an effective natural remedy. Studies have shown that peppermint essential oil can enhance gastric emptying in those with functional gastric emptying disease.